CPNet - NASA Administrator Daniel Goldin announce today that a team of scientists has found evidence of a primitive life form on Mars. "We are not here to establish beyond of shadow of a doubt that life existed on Mars," said Goldin, "but we have to open the door." The bacteria-like form was found on a meteorite, believed to have come from Mars, that hit an Antartic ice field 13,000 years ago. The meteorite was picked up in 1984. CPNet Poll: Do you think there is life on Mars? or, email us your theory. 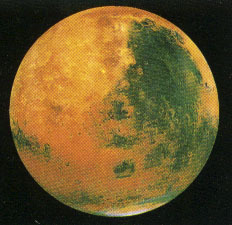 Known as the red planet, Mars is the fourth planet from the Sun and the outermost rocky planet. Astronomers first observed what were thought to be signs of life on Mars in the 19th century - but nothing like the microfossils found by NASA on the Antartic meteorite. The first signs of life included canal-like markings on the surface of the planet. It is now known that the canals are an optical illusion. Phobos and Deimos are the two irregularly shaped moons of Mars. Their small size indicates that they may be asteroids that have been captured by the gravity of Mars. Athmospheric compositions: Carbon dioxide about 95%, nitrogen about 2.7%, argon about 1.6% oxygen, carbon monoxide and water vapor about 0.7%. CNN Interactive. Pictures of microfossils, QuickTime movies, AIFF and WAV sounds. [email protected]. Current press information. Copyright © 1995, 1996, College Press Network. All rights reserved.